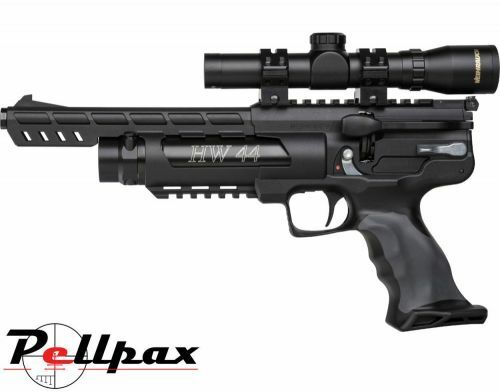 The HW44 utilises an action based upon the successes of Weihrauchs own HW100 & HW110 rifles to create a PCP air pistol that performs as expected from such a prestigious brand. The two stage trigger of the HW44 is fully adjustable in pull weight and travel ensuring a crisp and vibration free let off which also improves the pistols shot to shot consistency. The pistol is ideal for competition target shooting and is powerful enough to be used for short to mid range pest control. The HW44 is also fitted with a regulator to ensure predictable results no matter how full your air cylinder. In this calibre the pistol will provide around 125 full power shots. Optics and silencer sold seperately.